Posted 9/9/2013 3:08pm by Josie Hart. We would like to highlight some of the amazing CSA events we recently had at Chatfield. Our produce buyer and donation partner, Beverly Grant -- who runs the Five Point Farmer’s stands, Mo’ Betta Greens -- hosted a fun dinner for local food and farming partners called a Celebration of Hands. The event honored all the people in our community who have been working all summer to provide Denver with food, specifically food with integrity! Local chefs, a karaoke dj, Little Man Ice Cream with a pop up coffee bar and food donated by many wonderful organizations made the event great! We also hosted an event for the Gardens membership and research department along with members of D.U.G’s Master Gardener’s program for a night of education and delicious CSA-inspired food, prepared by Susan Evans. Susan teaches cooking classes for the CSA including the last weekend's tomato class. Thanks to our CSA staff for helping out with all of the events we have at the CSA! Please join us this THURSDAY for the FALL POTLUCK, 5:30 – 8:30p.m. We will meet in the Green Farm Barn at 5:30 p.m., with dishes to share. If you have to pick up your CSA share at Chatfield first, you can your bags of produce in our walk-in cooler during the potluck. For $10 a family (or car load) or $5 individual you can go through our corn maze before it officially opens and enjoy unlimited jumps on our giant bouncing pillow! 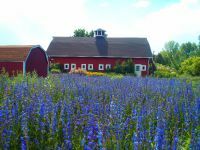 Enjoy food prepared by other CSA members and explore the beautiful place that grows your produce. Please park in the upper lot when you arrive, pick up your CSA share if you need to and head to the barn. We will provide drinks, just please bring a dish for six people to share and other picnic items. We hope to see you there! * Next week Yukon gold potatoes! Weekly Fruit: 2 small bags of pears, peaches or apples. Now we have the smaller bags please be sure to let a volunteer help you to choose the right combination of fruit bags! Combine all ingredients in blender. Blend slightly, to desired consistency. Place in non-metal, non-reactive storage container, cover tightly and refrigerate overnight, allowing flavors to blend. Toppings can include sour cream, chives, shredded cheese and croutons. You could also mound cooked shrimp or crab to ritz it up a notch – make a parmesan cluster to float on top as well. 1. Put the arugula in a bowl. 5. Toss the veggies with a small amount of dressing – only enough to lightly coat everything. ***We hope to see you all at this Thursday's potluck at The Green Farm Barn at Chatfield.